One hundred years ago this part of the isles was described as "the largest, wildest and most beautiful parish in Shetland"- the same could be said today. Northmavine draws people from near and far to discover its outstanding coastline, superb walking country, rich variety of wildlife, rocks and plants, and its fascinating array of historical and archaeological remains. Almost an island in its own right, only the narrow isthmus at Mavis Grind joins it to the rest of the mainland of Shetland. It has often been said that here you can stand on the shore of the North Sea and throw a stone into the Atlantic Ocean on the other side, though you would need a strong arm! From Mavis Grind you enter a vast and magical landscape dominated by Shetland's highest summit, Ronas Hill (1475 feet). To the east lies Sullom Voe, Shetland's largest sea inlet, and to the west is St. Magnus Bay and the Atlantic Ocean, which has battered the land into a scene of breath taking beauty. 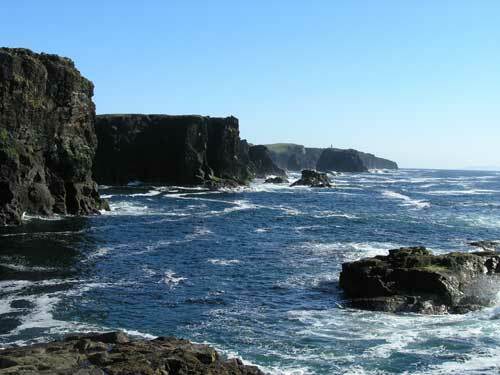 The coastline throughout Northmavine is remarkable, with magnificent cliffs, extraordinary rock formations, beautiful, deserted beaches and tranquil, sheltered voes. Inland this hilly country, peppered with trout-filled lochs, provides excellent walking, angling and unrivalled views. Public Telephones: Sullom, Ollaberry, Leon, Collafirth pier, North Roe, Hillswick, Urafirth, Eshaness. Churches: Sullom, Hillswick, North Roe, Ollaberry.